Hello everyone! I’ve been so lucky to have been around some amazing tattooed babes in the last couple weeks. I’d like to introduce you to my new friend Nicole! Nicole sent me an email about shooting together and mentioned that she was also a piano teacher. After I looked at her Instagram and saw her amazing artwork I knew that we could create some great images for Beyond The Ink. 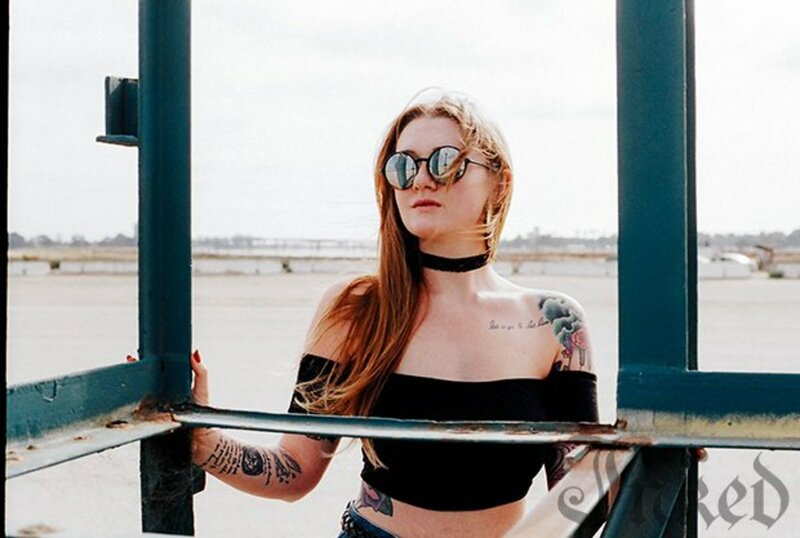 She drove down to San Diego from LA and we found ourselves shooting at Fiesta Island. Nicole was a total sweetheart and I think I was able to capture that in these photos. I hope you guys all like! Stay tuned, I’ve got a lot more coming up this summer! Hi nicole! Thank you for being a part of Beyond The Ink! 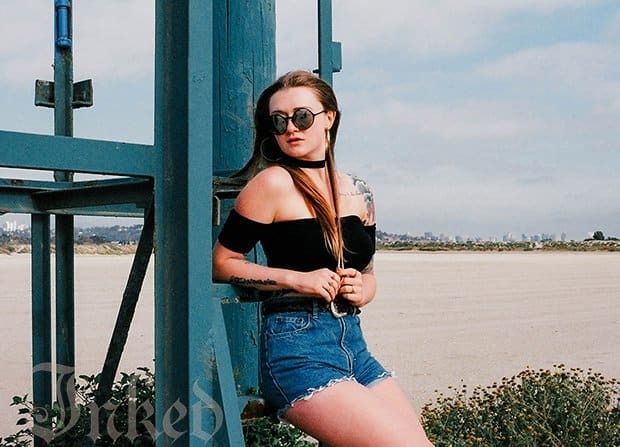 Can you introduce yourself to our Inked readers? Hi! I&apos;m 22-years-old and I was born and raised in Green Bay, Wisconsin. I&apos;m an only child and I lost my mother when I was six, so I&apos;m very close with my father. I started playing piano at age six because my mom wanted me to start all throughout her cancer. I pursued it all throughout elementary, middle and high school and went on to get a piano degree from DePaul University in Chicago. I moved to LA in July of 2015 and I live there currently as a piano teacher, model and keyboard player in a band. I also love to read, exercise and hang out with my friends! How has the move to Los Angeles from Chicago been for you? I&apos;ve definitely learned a lot about myself in the process. Because I&apos;m an only child, I&apos;ve always been very independent and self-motivated, and I have always preferred to do most things alone. I&apos;m so thankful for these attributes because I moved to Los Angeles from Chicago right after I graduated college, with nothing but my clothes and instruments and a music dream. I am so happy I took this chance, even if it means being 2,000 miles away from all my family and best friends—the hardest part of this for me. I’m sure it’s quite a change. You mentioned that you were a piano teacher. That is so cool! How long have you been doing that? I did some piano teaching for a class in college but I started teaching full time once I moved to LA in July of 2015. At first, I was skeptical of teaching—I never felt I was any good at dealing with kids. Now, I love my students and I look forward to seeing them every lesson; there is nothing as rewarding as teaching music! Yes! I sing and I play guitar. What is it like teaching others a skill like piano? To be able to pass on musical abilities to young minds that are innocently naive yet so open is truly a gift. My students are so receptive to everything I say, and I take great pride in being able to guide them during their musical journey. I constantly reflect back on how and what my piano teachers taught me during all my years of lessons, and I try to shape my teaching to somewhat be like theirs. Everyday I wake up and feel lucky and blessed that I get to devote my life to my musical craft at the age of 22. Do your students know that you’re low-key a hottie that takes babely pics on the internet? *Blush* I prefer to keep my modeling and teaching work separate, but if they see it, then so be it! Your tattoos are so cool, especially that beautiful back piece! Who does your work? Thank you! My first few small pieces were walk in pieces done by some artists such as Bill Smiles, John Haney and Kevin Leary, all at Family Tattoo in Chicago at that time. My main artist is Gilly Smash, I first started with him at family tattoo, then followed him to his current shop in Chicago named A+ Tattoo. He&apos;s done all my major pieces including my half sleeve, leg pieces and my back (which he drew himself!) and other small pieces as well. My only tattoo that I&apos;ve gotten in LA was done by Peter7 at 7Ink Tattoos in north Hollywood. What was the last tattoo you got? I just got my first realistic tattoo, the rest of my work is traditional. 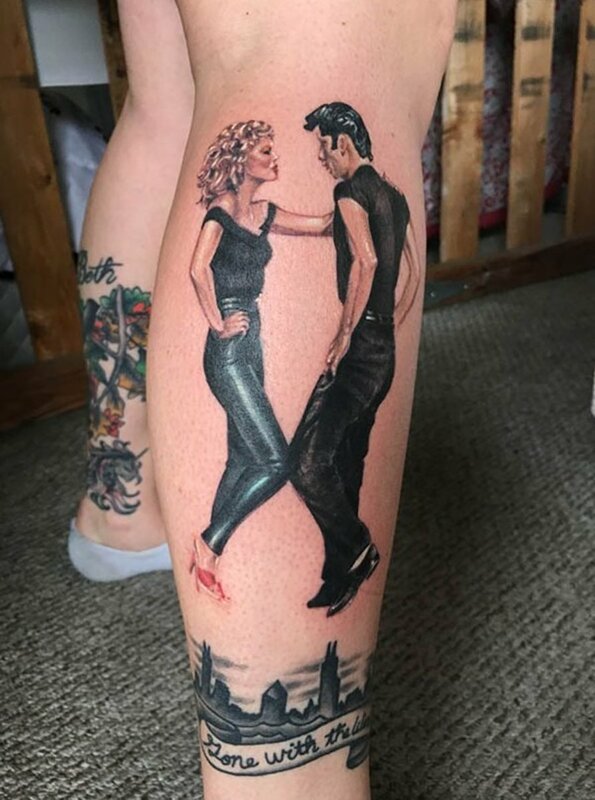 The realistic piece is of Danny and Sandy from Grease, my all time favorite movie since I was a little girl. The piece is also in memory of my little Shetland sheepdog who just passed recently, whom I named Zuko when I got him when I was 12 after Danny Zuko from Grease. The piece was done by Peter7 who actually went to the high school in Los Feliz where this scene was shot. So rad! Here&apos;s a picture of it right after I got it done! Any future tattoo plans coming up? I&apos;m planning on doing a Grease leg sleeve with each of the characters in their signature poses from the film. That will take a while, but I&apos;m willing to put in the work and effort with Peter7 to create something awesome!